Ballet is a beautiful performance dance which has evolved throughout time with roots from Italy, France & Russia. 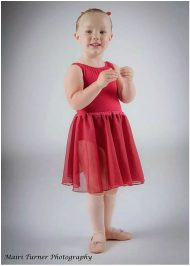 Ballet helps students develop confidence & Co-ordination as well as self discipline, it is a great genre to help with correct posture and encourages a healthy lifestyle. There is also a large amount of technique to be gained in Ballet dancing. Ballet is a great foundation for many other dance forms. We follow the Imperial Society of Teachers of Dancing (I.S.T.D) Syllabus. Tap dancing has many roots in African, Irish and clog dancing, all are individual styles that have one common link; rhythm. Tap is a great form of expression, using your feet to create rhythmic patterns. Modern dance is a rhythmical dance form often seen in musical productions it can be very energetic. involving running, skipping & leaping concentrating on the body's core stability and breathing. Movements are made to look easy and effortless however much strength and flexibility is needed to execute a good performance. Modern dance is a great form of exercise. It helps with strength & flexibility as well as musicality. Performance Workshop is an invited class for students who do a minimum of two genres, for students who are prepared to commit a little more time and enjoy performing. In these classes we work on body conditioning & stretching as well as creating dances, using technique learnt over all genres, using all different styles of music to produce group routines which are performed at different events throughout the year. These are fun lessons encouraging students to work as a group, combining steps they already know into the types of dances they see on stage in shows & musicals and television from x factor to Mtv. Within these classes we also work on performance & presentation skills. Its never too late to start dancing, whether your 18 or 80 you can always dance!! These classes are all about having fun whilst keeping fit and meeting new friends too. It doesn't matter your age, body size, physical ability everybody is welcome. You don't need any previous experience. There are classes for those who just want to dance and those who would like to perform too! !